Large dual colour circular date stamp, perfect for administrative duties. 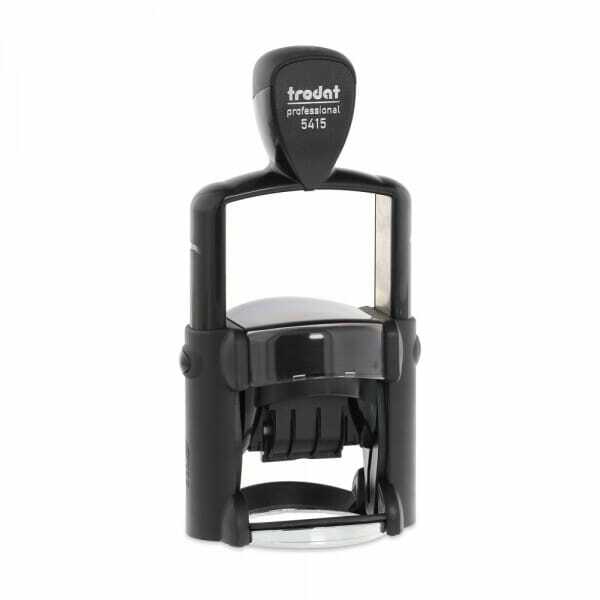 The Trodat Professional 5415 self-inking rubber date stamp can include up to 6 lines of customised text above and below the date. The date band includes date, month and 12 consecutive years. The date is easily set by turning the date bands, creating an impression of clue text and red date. Although supplied with a dual colour red and blue ink replacement pad, other colours of 6/15 ink pads are available including: black, blue, red, green and violet. Dry felt pads are suitable for special inks. Customer evaluation for "Trodat Professional Dater 5415 45 diam. - 3+3 lines"